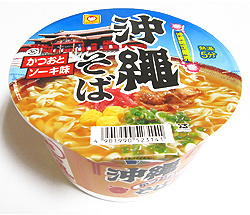 Toyo suisan Maru's Okinawa limited Okinawa Soba (noodles Cup) gift to snack, also highly edible please. Pouring boiling water 5 minutes! Maru-Chan is familiar from old in Okinawa Okinawa soba noodles. Noodles are staple flat noodles, ginger. It will be more delicious and taste pickled ginger, also put the コーレーグース! Easily put pork and fried eggs are good! 2. 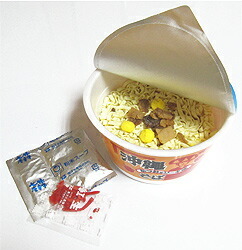 Drilling on surface powdered soup, boiling water poured into the inner line. 3. Cover after 5 minutes, stirring often, over shichimi in your favorite pickled ginger the gulasch and. Avoid high temperature, moisture, direct sunlight and store at room temperature.